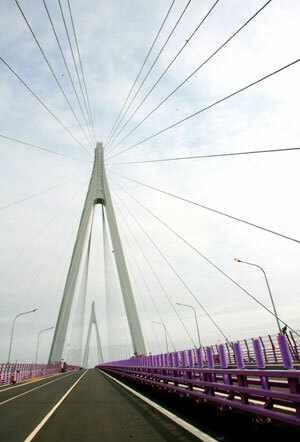 Hangzhou Bay Bridge, the world’s longest sea-spanning bridge, is set to open May 1 after almost five years of construction. The bridge links Shanghai to Ningbo in Zhejiang Province, cutting the traveling distance between the two port cities by 120 km and driving time from 4 to 2 hours, said deputy director of Hangzhou Bay Bridge project Jin Jianming. “The bridge will make regional economic connection closer between Zhejiang and Shanghai, and will help develop the Yangtze River Delta area which is aimed to become the sixth largest urban zone following Paris, London, New York, Tokyo and Chicago zones,” he added. Many enterprises have come to set up factories and workshops at Hangzhou Bay New Zone, the starting point of the bridge in Ningbo, due to the convenient location and lower costs compared with neighboring areas. This is what Gao Qingfeng, deputy chief of the Hangzhou Bay New Zone, wants to hear, as more companies are certain to bring more tax revenue to the local government. “Annual fiscal revenue will reach 354 million yuan in 2008, up 48.4 percent,” he projected. To ensure a smooth traffic flow across the bridge, engineers are making sure the infrastructure is safe to transport goods. Lin Wenti, engineer of the Hangzhou Bay Bridge, said on Tuesday the heaviest vehicle load capacity would be 55 tons in order to protect the bridge. “Wind-proof fences are fixed along the two sides of the two channel bridges, so that traffic can still cross even under strong gale conditions,” Lin explained. Jin said the toll fee is 80 yuan per vehicle and expects the 11.8 billion yuan ($1.68 billion) expenditure will be recouped within 15 years.